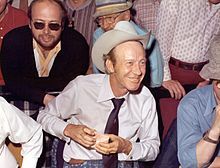 Amarillo Slim at the 1974 WSOP. Thomas Austin Preston, Jr. (December 31, 1928 - April 29, 2012), known as Amarillo Slim, was an American professional gambler known for his poker skills and proposition bets. Preston won the 1972 World Series of Poker (WSOP) Main Event and was inducted into the Poker Hall of Fame in 1992. Before becoming a well-known tournament player, Preston was a rounder, touring the United States looking for gambling action along with Doyle Brunson and Sailor Roberts. Following his WSOP victory he appeared on several talk shows, including The Tonight Show, and had a small part in the 1974 Robert Altman movie California Split. He appeared on I've Got a Secret, where his secret involved losing $190,000 in one night of poker. Preston won four WSOP bracelets including two in Omaha. Preston's final WSOP win was in 1990. In the $2,500 Pot Limit Omaha event at the 2000 WSOP he came in second to Phil Ivey. Preston's tournament earnings total more than $587,000. In January/February 1980, Amarillo Slim hosted the Second Annual Poker Classic, which was the second-most prestigious poker tournament of its time. This series eventually came to be called the Super Bowl of Poker and continued until 1991. Gabe Kaplan became the first winner of this tournament series and Stu Ungar won the title three times. In 1973, Preston and Bill G. Cox wrote Play Poker to Win which was published by Grosset and Dunlap. A revised edition was published by HarperCollins in 2005 entitled Amarillo Slim's Play Poker to Win. In May 2003, Preston published his autobiography Amarillo Slim in a World Full of Fat People, where he wrote of playing poker with Larry Flynt, Lyndon Johnson, and Richard Nixon among others. In addition to his poker exploits, Preston wrote about his exploits in proposition betting. In April 2007, Preston created a website and released an E-Book called All In: An E-guide To No Limit Texas Hold'em. The book was written by Preston along with Joe Brent Riley. Thomas Austin Preston, Jr. was born on December 31, 1928, in Johnson, Arkansas, but when he was an infant his parents moved to Turkey, Texas. After they divorced, his mother returned to Johnson, while his father moved to Amarillo. Slim is quoted as saying: "It's a good thing he did, because Amarillo Slim sounds a heck of a lot better than Turkey Tom or Arkansas Austin." Preston was divorced, had three children, and lived in Amarillo, Texas. In August 2003, Preston was indicted in Randall County, Texas on charges of indecency with a 12-year-old grandchild. The charges were reduced to misdemeanor assault in a plea bargain and on February 10, 2004, Preston pled "no contest" to the reduced charges, "to protect his family". Preston received a $4,000 fine, two years probation and was "ordered to undergo counseling". In a 2009 interview, he stated that he was innocent of any wrongdoing, but chose to take the plea bargain in order to spare his family from a court trial. Early on the morning of October 4, 2006, Preston was the victim of an attempted armed robbery. The armed robber fired three bullets into Preston's car as he sped away. Preston was not injured. On January 28, 2007, Preston was robbed at gunpoint while in his home. On January 22, 2009, Preston was beaten and robbed near the intersection of Interstate 40 and Soncy Road while attempting to collect a gambling debt. Preston's autobiography was the topic of a biopic movie reported to be under development. Nicolas Cage reportedly was to play Preston's character in the movie. According to a 2009 article at Poker Listings the "planned Hollywood movie about Slim's life" has been "dropped". Amarillo Slim died on April 29, 2012, of colon cancer at the age of 83.